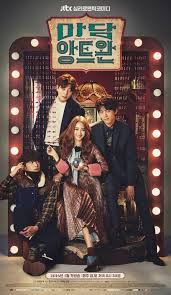 Go Hye Rim (Han Ye Seul) is a fortuneteller known as “Madame Antoine” due to her supposed spiritually connection to Marie Antoinette. She uses her intelligence and keen sense to read her clientele. When Choi Soo Hyun (Sung Joon), an expert psychologist, opens his clinic upstairs, they clash instantly. Partially out of petty revenge, he chooses to enlist her in his psychological experiment to prove that love does not exist. As part of the experiment, he and two other men will woo Hye Rim. However, what will happen as he begins to fall in love for real? And will she ever be able to believe in him again when the truth of this experiment is revealed? I can’t believe I finished this one. This drama is SO weird. It started off as a really strange and peculiar drama, fortunately it picked up later. Can’t hide I was SO close to just drop it. Firstly, it’s because of the bizarre ‘experiment’ we get introduced to. Fool a woman into falling in love just to test how much she would sacrifice for that person. All that to prove that love doesn’t exist, and that it’s just some drug infused by the brain. What the heck? That made the whole thing so predictable! HOWEVER, it doesn’t go as you expect, maybe that’s why I finished it. It was hard to continue in the beginning when I kept feeling the need to punch Sung Joon in his handsome, smirking face. After all, he doesn't deserve that pain for being an excellent actor. And trust me, any guy who gets me from 0 to "gosh, you are a JERK" within the first five minutes of a drama is an excellent actor, bizarre storyline and complete spectacular of psychological ethics aside. In the description, they had put ‘psychology’, so I did expect a lot more of that in the drama. I loved the small cases they had in between, but I just wasn’t satisfied with it. Overall, a weird drama with a smooth save in the middle.